Mojave Rd from Basin to Zzyzyx: Deep sand, confusing navigation. Mojave Rd from Zzyzyx to 17-Mile Point: Easy and fun (in dry fall weather). Don't count on getting from Mojave to Zzyzyx. The goal for the first day of this trip involved a slight detour on the way to our hotel: a section of the Mojave Road entering Mojave National Preserve from the south. On most maps, the Mojave Road enters the preserve at Soda Lake, a bit east of Zzyzyx (pronounced Zye-zix, we're told, not Zizzix.) We'd been warned in the past that any hint of rain turns Soda Lake into a slippery, muddy truck-eating quagmire, so it's important to inquire first about conditions before attempting it. But some study of Google Earth had convinced Dave that there's a road not shown on the maps going from Mojave Rd. across to Zzyzyx. All we had to do was take the Basin Rd. exit off I-15, turn onto Mojave Rd at the big metal signpost, and head north until we hit Soda Lake. If the lake surface looked bad, Zzyzyx would be an easy out. This section of Mojave Road, it turns out, is a complex braid of dry washes of sand so deep that turning the steering wheel is more a suggestion than a control. That's great fun, as long as you're getting enough traction and not bottoming out. Occasional rock cairns tell you you're on the right track. ... Until you stop seeing cairns. At some point I took the road less braided and ended up driving across sand dunes before the route finally rejoined the Mojave Rd. 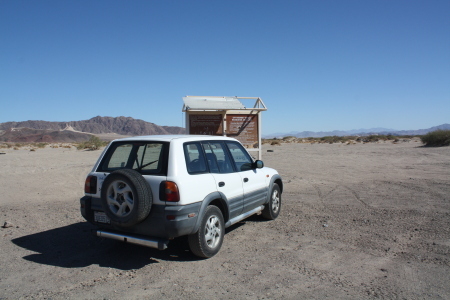 Fortunately the Rav4 handled the sand very competently, without ever needing its magic center-differential-lock button. Eventually we got back on something resembling a main road, which had turned into whoop-de-doos -- endless irritating hummocks that took patience but no great driving skill as the road skirts along the southern edge of a Wilderness area: no vehicular access. Rasor Rd comes in from I-15 somewhere around here, and the area is popular with ATVers: we saw quite a few groups camping. Finally we got to Soda Lake. The sandy road turned to smooth hardpack as it entered the lake bed -- by far the best road we'd seen since leaving I-15, and we drove out with no hesitation. We could see deep tracks off to either side of the road -- obviously lots of people experiment, and just as obviously the surface isn't quite as good if you get off the road, but we had no trouble on this dry October day. Before long we saw Zzyzyx off in the distance on our left -- and no road going there. 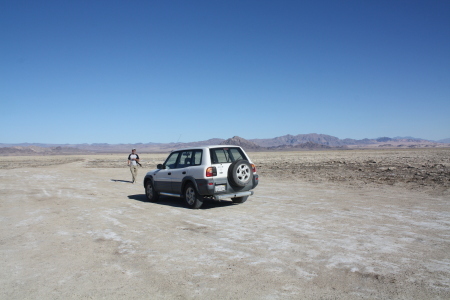 But if the road across the dry lake was this good, why would we want to turn off to Zzyzyx at all? At the far side of the lake are a couple of steep rises in deep sand -- but nothing too tricky, and much easier than the sandy sections south of the lakebed. The rest of the trip was just normal dirt-road driving, between the more-scenic-than-their-names-suggest Cowhole and Little Cowhole Mountains, through a small basalt flow (evidence of some nice big bubbles visible in the walls), and finally back onto pavement at Kelbaker Road and north to Primm.